Tui Ora celebrated Immunisation Week this year with a one-day pop up vaccination clinic in Waitara. The clinic which took place at the Maori Women's Welfare League rooms encouraged clients and members of the public to get immunised and protect themselves, their whānau and the community. Teaming up with the Taranaki DHB and Pinnacle Midlands Health, it was standing room only at the clinic which ran from 9 to 3pm. Children, mothers and flu fighters all queued up to get their jabs with many sticking around afterwards for tea and a chat. In total 77 vaccinations were administered. Tamariki Ora nurses Sonya Popovich, Sarah Cox and Gaylene Corry were on hand to give the injections, and were wowed by the amount of people taking it up. "We've hosted clinics before but nothing as big as this. There has been a really impressive turn out," said Gaylene. New mum Freedom Edmonds isn't taking any chances this winter. With two-week old Kupa in tow, and another toddler at home, she simply doesn't have time for the flu. She got vaccinated last year too and says the quick jab is a small price to pay for a flu-free year. 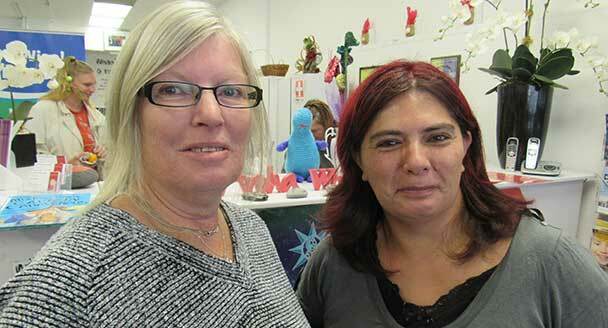 Returning this year for their vaccinations were locals Gaelene Cole and Melody Peel (pictured below). "I volunteer at the Salvation Army and when I heard the clinic was happening I thought I would definitely come along. I managed to rope in four of my colleagues to come too," said Gaelene. Eight year-old Zayne O'Carroll didn't need to be convinced to have his flu jab. He was at the clinic with Mum Nikki, four-year old sister Tillie, aunt, Mattie (19) and grandmother Carmen. National Immunisation Week runs every year in May. This year the week runs from 1-7 May with the theme "ensuring that your teen is immunised". Teenagers (male and female) are encouraged to get the HPV vaccination that protects against most types of HPV (human papillomavirus) cancers as well as to make sure they are up to date on their other immunisations.